European Union has decided to spend 3 million Euros to research “the potential of insects as an alternative source of protein”. EU says that research projects will be selected during this year. Food experts agree that insects would probably have to be disguised for European audiences, so the insect “food” could be used as an additive in burgers and other fast food. The UN’s Food Standards Authority says of the research: “While insects have not traditionally been used for food in the UK or elsewhere in the European Union, it is estimated that about 2.5 billion people across the world have diets that routinely include insects. Some worms contain three times as much protein as beef per ounce, while four crickets have as much calcium as a glass of milk. Daniel Creedon, a chef who serves ants, locusts and bees in honey at the London Archipelago restaurant, said: “If insects start coming into the food chain they are probably going to have to be disguised. Website Treehugger said: “It is not hard to imagine the development of an insect-based food additive that enriches burger and nugget protein levels. 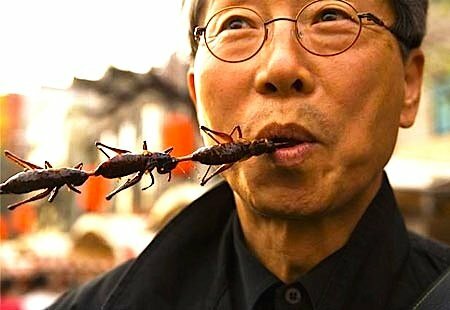 80% of countries on Earth already eat insects, and more than 2,000 insect species are often eaten by human beings. Unlike conventional livestock, insects and bugs need little space and can be bred in sealed buildings under natural light where they live off waste, paper and algae. The idea has previously been backed by the UN and EU as a way to tackle food shortages. Some academics believe that the expense and environmental cost of raising livestock means that insect-eating will be inevitable – and it has been claimed that by the end of this decade, insect-eating will be widespread. An estimated 2,000 insect species are consumed around the world, and people do not just eat insects, they relish them as delicacies. In Africa, caterpillars and winged termites are fried and eaten as roadside snacks (after wings, legs, and bristles are removed, of course), and often considered tastier than meat. Grasshoppers and bee larvae seasoned with soy sauce are favorites in Japan, where pricey canned insects are also available. Papua New Guinea is known for its nutty-flavored sago grubs (Rhynchophorus ferrugineus papuanus or R. bilineatus), beetle larvae that inhabit dead sago palm trees and are honored at annual festivals. Insects often contain more protein, fat, and carbohydrates than equal amounts of beef or fish, and a higher energy value than soybeans, maize, beef, fish, lentils, or other beans. According to a 2004 United Nations Food and Agriculture Organization (FAO) report, caterpillars of many species are rich in potassium, calcium, magnesium, zinc, and iron, as well as B-vitamins. In some African regions, children fight malnutrition by eating flour made out of dried caterpillars. Pregnant and nursing women as well as anemic people also eat caterpillar species high in protein, calcium, and iron.